Your diaper bag has an important job to do. Not only does it carry all of your baby and parent essentials, but it also keeps everything organized and easy to find, so you can grab exactly what you need, right when you need it. Your diaper bag should be able to hold everything from diapers and wipes to your baby’s favorite toy and pacifier. With the right bag, you’ll be prepared for any minor emergency, such as a diaper change or bottle break. It can make your life much easier and help reduce the stress you experience on regular outings with your baby. Diaper bags are the ideal item for any new parent and can provide the perfect baby shower gift idea. A diaper bag is a storage bag with various pockets to help you organize everything you need for your baby. Diaper bags come in all shapes, sizes, and types, including tote, backpack, and messenger styles. Each bag has its own special features, such as changing pads, strap systems, and bottle holders. There are also fashion-forward bags available, so you don’t have to sacrifice your personal style. Sure, we’d all like to have a famed Petunia Pickle Bottom diaper bag or a stylish Ju-Ju-Be diaper bag, but you don’t need to spend $100+ on a glorified purse. That’s why we’ve found some of the best diaper bags on the market, so you can get the space you need with a design you love. 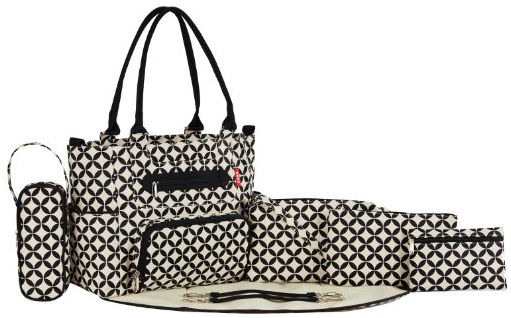 The Skip Hop Baby Duo Signature Diaper Bag combines style and function. It can be worn as a fashionable bag or it can be easily attached to your stroller. The high-quality BPA-free, phthalate-free bag is versatile, roomy, and will allow you to organize all your items with a multitude of pockets. The sturdy polyester bag features a spacious interior with contrasting lining and a zip-top closure. It has 10 pockets including two elasticized, mesh bottle pockets, an easy-access tech pocket, toy ring, tote handles, and convertible, adjustable shoulder-to-stroller shuttle clips. It also includes a removable cushioned diaper changing pad, allowing for quick diaper changes anywhere. The award-winning diaper bag is available in various colors and designs to match your personal style. It is an Amazon best-seller and the brand is recommended by Consumer Reports. Skip Hop is also one of the best-selling and most globally recognized brands of diaper bags. 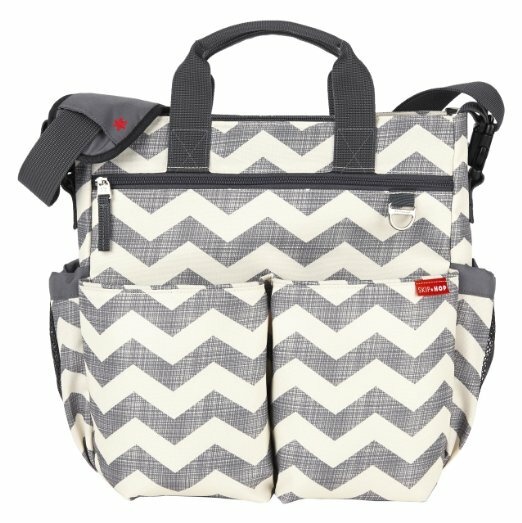 The Diaper Bag by Hip Cub is intended to remind you of a designer bag, while serving the purpose of a versatile diaper bag. The stylish, functional bag features a secure zippered spacious interior, two interior compartments, two exterior front pockets, and two secure zipper side pockets. The high-quality cotton canvas bag also includes an adjustable shoulder strap, short handles, matching stroller straps, and removable matching padded diaper changing pad, allowing for quick diaper changes anywhere. This is available in two colors. It is an Amazon best-seller and has more than 500 five-star reviews on Amazon. It is also backed by a 90-day money-back satisfaction guarantee. Amazon’s #1 best-seller in diaper bags, the Graco Gotham Smart Organizer System Back Pack Diaper Bag offers style, functionality, and the best in organization. It is large, sturdy, and designed to keep you organized, no matter how much you need to store. The smart organizer system features a spacious interior, multiple exterior zippered compartments, and individualized storage pockets for baby necessities, keys, phones, wallets, and more. 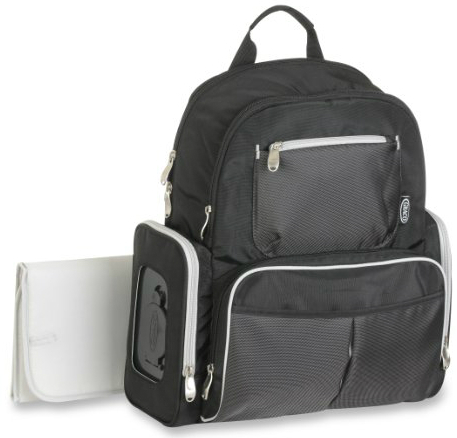 A wipes case dispenser is located on the exterior of the backpack for ultimate convenience. The insulated bottle pocket offers optimized temperature control for up to two bottles. You can choose from an easy-tote carrying handle or adjustable, padded shoulder straps for all-day comfort. It also includes a removable plush diaper changing pad, allowing for quick diaper changes anywhere. This is one of the “most wished for” items on Amazon and has more than 300 five-star reviews on Amazon. 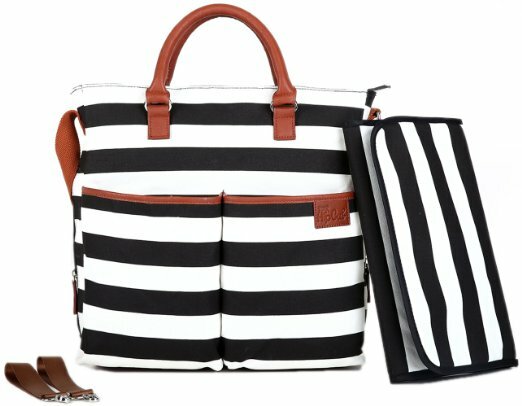 The Soho Designs Grand Central Station Diaper Bag seven-piece set offers a great value at an affordable price. The high-quality tote bag has a spacious interior with zippered closure, multiple pockets, and a carrying strap. The set also includes a zippered closure small purse with carrying strap, an insulated zippered bottle bag, and two accessory cases, so you can easily carry everything you need. You can store the smaller bags in the main diaper bag or carry them separately. The set also includes grips stroller attachments and a removable matching padded diaper changing pad, allowing for quick diaper changes anywhere. This comes in various colors and designs to match your personal style. It is an Amazon best-seller and has more than 300 five-star reviews on Amazon. 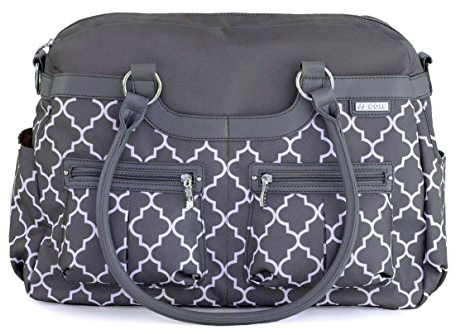 The JJ Cole Satchel Diaper Bag can help you organize everything you need throughout the day. The sturdy polyester bag combines style and functionality. It includes a spacious interior, exterior open and zippered pockets, multiple organizational compartments, a convenient bottle pocket, and four interior side pockets for baby essentials and everything else you may need. It also includes a detachable padded shoulder strap, grips stroller attachments, and matching removable diaper changing pad, allowing for quick diaper changes anywhere. This is available in a range of designs and colors to suit your personal style. The brand is recommended by Consumer Reports and the bag has more than 300 five-star reviews on Amazon. And those are our recommendations for the best diaper bags. As always, be sure to check Wise Bread's Buying Calendar to learn when and how to buy just about anything!